The BAUM ST90 Stitchmaster ensures profitable production, even with the frequent format changes and the short to medium-length runs now required by the market. 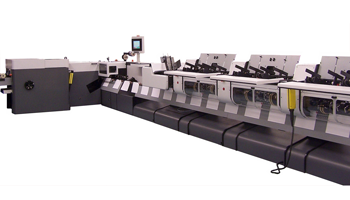 The BAUM ST90 Stitchmaster is an ideal saddle stitcher for commercial printers and binders specializing in short and medium run length print runs. This saddle stitcher also ensures consistently reliable production and can be prepared for each new job quickly and efficiently with the aid of the new touch screen control. The modular design of the Stitchmaster ST 90 lets you configure the saddle stitcher to suit your specific needs. The Stitchmaster ST 90 can be configured with up to 8 vertical pockets and a cover folder feeder or maximum ten vertical pockets. Single or double manual feed stations can be included in any machine configuration.